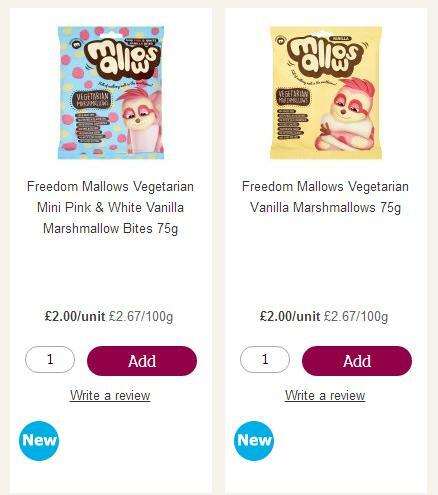 The Vegan Magpie: Sainsbury's now sell Freedom Mallows! Hello! I'm here to tel you that Sainsbury's now stock Freedom Mallows!! This is not a post about any offer on them, however it can help save you money as they are a little cheaper than elsewhere. They are being sold for £2.00 a pack with the mini mallows (mallow bites) and larger vanilla mallows being available. Often this are sold for around £2.50 a pack, so if you buy them often, this could help save a fair bit! Good for hot chocolates, baking, most things you'd want a mallow for really. I appreciate people like to buy from independent stores, so this post may not be of interest to everyone.